I INSPIRE PEOPLE TO BE THEIR TRUE SELVES. I wish everybody could and would live their full potential. So, half of my time is dedicated to raising consciousness with people with that desire, so that they can become the best they can be: your true Self. The person you are meant to be. The other half, I spend as a global explorer: contributing to serve Earth, working with the Global Goals for Sustainable Development. I always try to live the Golden Rule ('Treat others and the planet as you wish to be treated', rebootthefuture.org), so I love creating rituals and ceremonies with nature as our biggest teacher. Masterclasses transformation, purpose, personal leadership, sustainability ao. * 2019: June 3-19 and as of September 2019 a lot of availability. If you want to connect, send me an email via the form on the bottom of this page or email me directly at: vivubuntu@gmail.com. Looking forward to talking to you if my offer resonates with you! If you want to know a bit more about my ways of working and what activities look like, feel welcome to deep dive in VivU BuntU here below :-)! The famous iceberg model, that applies both to personal behaviours and organisations: 10% is what we see, which is determined by the 90% we don't see..
"True leadership is mastering authenticity". The more people understand what drives their behaviour, the more compassion they can have towards themselves. The more you know and love yourself, the more you can give to other people and the world. That sounds lovely and simple. Yet it isn't. It takes courage to deep dive in your beliefs to discover where they come from. You need guts to learn how your worldview has been built. But those who did it, they know: it is such a gift once you become conscious and start walking your own path, living your own life like you are meant to be! So I love coaching people individually to get to know and understand themselves better. Like I love to support teams getting to know themselves and each other and bridge that to doing business in a more successful, fun, humane way. In the end, we are all the same, yet every question I get is different. That is why I find it really important to always start with a live get-together to connect to you and your question. In that way we can make sure I am the right person for you and I can listen to your question and the questions underneath, to make you a tailor-made session, event, gathering, whatever it is you had in mind. Similar to the iceberg model, theory U is aimed at getting in touch with your true self, your inner wisdom. Instead of making a 'quickie' and crossing the U on the top from a dilemma to a solution by a quick fix (at the very probable risk that this is not a very new, innovative solution and it will probably, again, not work ;-)), the model facilitates in descending underneath the iceberg in a very profound way. If then, you arrive at the other end of the U, you have explored a dilemma in a 360 degree way, have found many creative possible solutions and really embodied the solution you have chosen in your mind, heart and body. Whether I am facilitating a session, organising a retreat for you or doing a coaching session of 1,5 hours, I will always give my best to facilitate a full U process. I am so enthusiastic about Barrett's model, which is based on Maslow's needs. Richard Barrett expanded that to a consciousness model, fitting to the needs of people living in today's world. That is: in the part of the world where I live (Netherlands), we have the luxury of having all the means to fulfil our basic needs quite easy. So we have space enough to make our lives meaningful. So to me, focussing on purpose and happiness are not trends, but a very logical consequence of living in this part of the world and this era. I see it as a responsibility to life itself. I am very happy that more and more people, schools, organisations start working purpose and values driven. 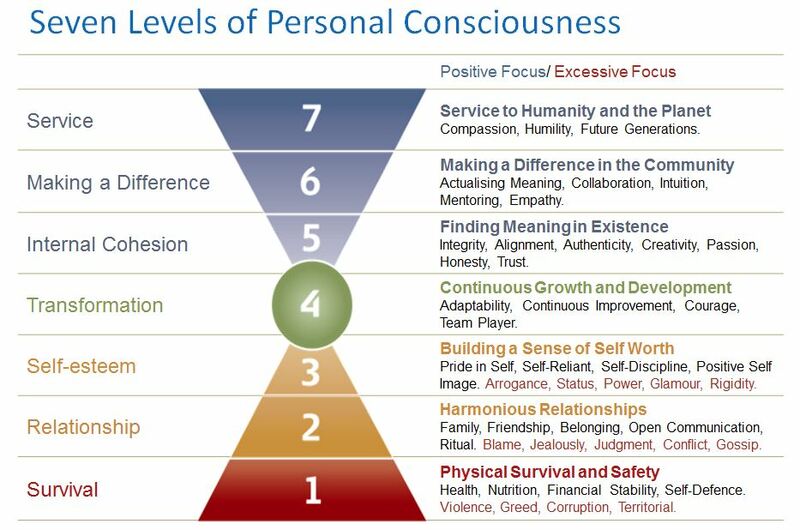 So whether you want to work on your personal leadership, organisational leadership, purpose of the company or find the meaning of your life, this model is a great help in becoming conscious about what you need to do to get there. Personally, I choose three core values every year to explore and develop for myself. This year (2019) those are: wellbeing, freedom and wisdom. You can read the lessons learned in my personal journeys in my blogs! To me, it is very obvious that we all need to contribute to the world's issues of today. It is not somebody else's problem, not up to youth to solve...I truly feel everybody can take some kind of responsibility (however small or big). To me, the global goals are a clear framework to work towards 17 important goals that we have to (and can) tackle in 2030, if we collaborate. I am very open for any kind of partnering around the global goals, whether it is about people becoming conscious, women's rights, a more sustainable world or the next generation. Have a look at my global goals for my latest discoveries! Part of a worldwide 'Reinventing ourselves' facilitators movement. Finding new innovative ways to facilitate transformation in order to speed up transformation so desperately needed in the world. Organising and attending inspiring get-togethers with like-minded souls exploring their best selves and where to have the most added value to the world. Ambassador of movements like The World of Consciousness and Down to Earth to invite as many people as possible to become conscious and take care of the earth in their own way. Guiding at Down to Earth@work: co-create events around sustainability, culture and leadership development with customers using the movie as the main source of inspiration, since the movie is meant to be worked with, not to be consumed. Living and incorporating the global goals for sustainable development in all my activities. Hosting the Amsterdam People Hub for the Global People Summit (SDG's). The theme for the Amsterdam People's Hub September 22 was to be a spark that lights the world. At the fireplace joining the Global People Summit online. You can read my reflections on the Global People Summit and the lessons I learned from Maxima in my blog. Organising an Inspiring Self Retreat of 3 days in September at Texel, combining inspiration for your personal leadership with a lot of body treats and being in nature. Purpose coaching: coaching individual people in the process of transforming their careers or lives to serve a better world by connecting and sharpening their purpose, helped by their key values. Organisation innovator and inspirer of transformation at NS (Dutch Railways) operations. Design and organisation of inspirational events like 'INTO YOUR NATURE'. See for yourself to have an impression. You can contact me by sending me a message via this form or email me directly at: vivubuntu@gmail.com.